Please choose a scent or you will receive UNscented. *Butter will be firm in cooler temperatures and can become liquid in extreme heat. Be cautious when opening your jar. With out a doubt, this is the finest moisturizer you will ever use on your body. Pure, natural shea butter melts into your skin and leaves it silky soft and smooth all day long. Not just a few minutes like other less emollient butters. If you have not experienced shea butter - we highly suggest it! You will probably never go back. It has an array of amazing healing properties stemming from its physical make up of vit. A, vit E, and cinnamic acid. Our shea butter is manually refined to give it a super creamy, light consistency with minimal to no scent. Our shea butter is collected from the Karite tree in the savannah grasslands of West Africa. It is a very soft butter and is considered to be of superior quality. Platinum Skin Care is exceptionally pleased to be able to offer you this preferable variety of butter! It is unprocessed and does retain a slight aroma. It smells like an oil or fat (hence its high moisturization properties). We suggest a light fragrance is added. *We have several to choose from. Shea butter leaves skin supple and soft. Heal and soothe irritated skin. Shea butter is excellent for use on babies and children. Shea butter naturally softens their skin and protects it against elements. We recommend Unscented for babies. Heal and soothe irritated, itchy skin. Shea butter is anti-inflammatory. It increases the healing of wounds and improves scars. It is used to heal eczema, burns, rashes, severely dry skin and to lessen the irritation of psoriasis. Soothes skin after shaving or waxing. The sun produces free radicals which in turn increases the rate at which skin ages and can even become cancerous. To avoid damage skin needs year round protection- especially with the decreased ozone layer. Shea butter contains natural UV sun protection. Daily usage of Shea butter on the face and body drastically reduces sun exposure- slowing down the rate of aging due to external factors, as well as acts as a natural mantle to protect against elements such as cigarette smoke, smog and chemical pollutants in the air. 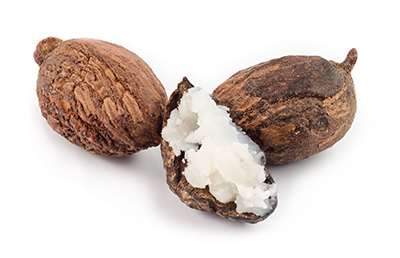 Shea butter can be naturally or chemically extracted using the chemical hexane. Hexane alters the affect and purity of Shea butter. Our Shea butter has been naturally extracted, cleaned and deodorized by our African Shea Butter source withOUT the use of hexane. Shelf life of approximately two years from date of purchase. Awapuhi Seaberry - Awapuhi is Hawaiian for "White Ginger." Imagine a fresh ocean breeze with a whisper of floral accompanied with a perfectly mastered blend of melons and berries. This is truly an island sensation. Apple Jack - A festive combination of McIntosh red apples, juicy oranges and Madagascar vanilla perfectly complimented with our own special blend of spices. This one has "tis the season" written all over it. Bay Rum - animalistic growl for men! Bergamot & Chamomile Fragrance - A smooth bergamot scent with hints of tangerine, neroli, green moss, pear in a light chamomile tea. Bitter Orange Orchid Fragrance - it smells just like orange pekoe tea with a touch of floral. It's rich, but not too heavy and lingers on your skin. Blueberry Muffin - Blueberries, vanilla, butter, sugar and a hint of spice make up this fragrance. Brown Sugar & Spice - Vanilla hints and light baking spice breezes are companions to the brown sugar anchor. Chocolate Mousse - Chocolate mousse smells like a freshly made milk chocolate dessert. Cotton Candy - Cotton Candy is more than just pink fluff, it has vanilla notes mixed with hints of cherry. Cucumber & Melon - A perfect blend on melons and cucumber with incredible results in cold process soap! Energy Fragrance - A revitalizing and refreshing citrus scent with fruity notes of mango, papaya and lime. Gingerbread and Spice - This old fashioned medley is the perfect infusion of molasses and brown sugar; topped with the perfect blend of cinnamon, nutmeg and ginger. Green Tea - Green Tea is celebrated for its unique, refreshing and subtle aroma. Hibiscus Passion - Top notes of green pear, crisp apple, a fresh pineapple are intertwined with cress, hibiscus, muguet, and violet blossoms while sheer musk adds character and sophistication. Iced Pineapple - Ever thought of bringing sand and a wading pool into the family room? Deliciously tropical pineapple and coconut. Juicy Pear - This new pear will have you drooling. Fresh, fruity, green and staying power! Lilac - A fresh spring floral that can almost melt the snow away by itself. Refreshing and soft, not heavy. Northern gardeners will recognize this fragrance immediately, just as Southern gardeners recognize gardenia. Love Spell - Just like at Victoria's secret. Pink Sugar - Pink sugar is a blend of bergamot, raspberry, fig, vanilla, caramel and musk. Many references show a scent of barbe-a-papa which means Papa's Beard meaning cotton candy. Absolutely fabulous! Plumeria - Plumeria is a Hawaiian delight that is out of this world. The fragrance is also known as the Flower of Bali or frangipani. Like B&B works. Punch Party -A fun, fruity scent that is fabulous for summer! An umbrella drink blend of pineapple and coconut, with a touch of banana and a twist of lemon. How could we make it better? We topped it with a single raspberry! MMMMM! Strawberries and Champagne - Created as a mimic of Victoria's Secret. Tangerine & Tulip - A blend of citrusy notes and fresh spring florals. Tangerine, lemon, white lily, tuberose and carnation make this fresh breezy fragrance a winner. Warm Vanilla Sugar - Yes, it is a type! Bath & Body Works has the original. We have just improved upon it. Halle by Halle Bery for Women Version - Floral Woody scent with fig and mimosa. Issey Miyake for Men Version - A spicey geyser, citrus, mandarine orange zest, bergamot, yuzu and sweet orange, camphor, cardamom, cinnamon, nutmeg and saffron, blue water lily, incense, ambergris, benzoin and papyrus wood. Ed Hardy for Men Version - Citrus effects of bergamot and madarine, clary sage, sequoia wood accords, musk and amber.